Kenneth Emson's Plastic uncannily captures the pressure cooker environment of comprehensive school. For its pupils, the trivialities inside the school gates are of monumental significance, providing a bubble-wrapped microcosm of impending adult life. For some, this will be where they peak - popular, cool and athletic. For some, it will be an oppressive hell. For most, it will simply be life as they know it. Plastic follows three pupils and one former pupil as they experience a day that'll change their lives forever. They are; Jack (Louis Greatorex), an average kid who's easily embarrassment and just trying to keep his head down; Ben (Thomas Coombes), Jack's best friend and bullied to the point of mental breakdown; Lisa (Madison Clare) childhood friend of Jack and Ben who has now drifted away to socialise with the 'cool kids'; and Kev (Mark Weinman) formerly the much-loved captain of the school football team, now unemployed, directionless and mildly depressed. The four work their way through a narrative that, spelt out beat-for-beat, is pretty straightforward. However, Plastic really shines in the way that story is told, using various literary and theatrical techniques to impress upon audiences the gravity and oppressiveness of events, and to give us a taste of what it's like to be within the story looking out, rather than merely observing passively. One of Emson's best weapons is loosely lyrical repetition. Phrases and words refract throughout the narrative: "Reebok classic of a day today", "Columbine, Virginia Tech, Sandy Hook", "Blink". These (any many similar elements) combine into a fractal script that loops in descending spirals around key events in these characters' lives, granting small moments weight and meaning. It's a perfect simulation of the schoolyard mindset, in which the smallest embarrassments or triumphs are magnified and dwelt upon. It also neatly communicates the act of remembering, with the play not told from one viewpoint but the hazy amalagmation of several memories. This detachment allows Plastic to repeatedly unmooring itself in time and space and allowing its characters to drift through the years. Though it is all about one very important day, we take dreamy trips into distant potential futures and even right back to the moment of birth. Even better, Emson doesn't get knotted up in the ambitious technique and form, always ensuring that we're emotionally as well as intellectually engaged with what's going on. This emotional engagement helps the play navigate some slightly choppy waters later on in the narrative, in which we get into male entitlement and violence. It's here that the one (small) fly in the ointment lies: the play is so good at amplifying everyday adolescent terror and lust that a step into more sensational territory feels a bit out of step. Granted, this event leads directly to one of the best scenes in the play, but I almost feel that the play would be more powerful if it were just about the crushing importance of apparently trivial interactions. In addition, the ethical (and, let's face it, criminal) issues of a romance betweem a twentysomething and a schoolgirl is perhaps glossed over, but Emson at least contextualises this and grounds it in the characters. Anyway, to put the big juicy cherry on top of the thing is that it's marvellously performed and produced. I can't slide a Rizla between the cast members, though I have to single out Madison Clare's impressively multi-layered performance given that it's her professional stage debut. 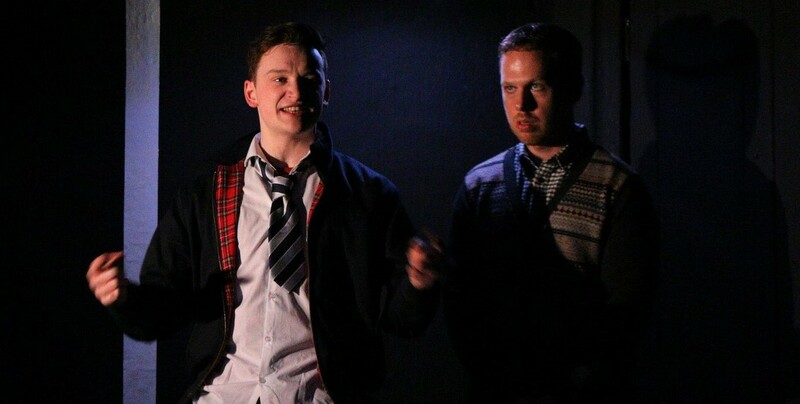 Josh Roche's direction also nicely takes advantage of the performance space and smartly forgoes scenery in favour of Peter Small's excellent lighting - which consisting of lightbulbs hanging from overhead tracks that can be propelled across the stage. It adds up to a genuinely gripping piece of theatre, one in which it feels like every creative involved understands the piece, is working on all cylinders and is pulling in the same direction as everyone else. Plastic is a testament to the potential of fringe theatre, a full-throated demonstration of what can be achieved with brains, talent and a relatively modest budget. Plastic is at the Old Red Lion until 21st April. Tickets here.